The podium is made of red oak, stained Minwax Ipswich Pine 221, two coats sanding sealer, two coats of lacquer, sprayed. It is to be donated to our local police department to thank them for all they do for the community. The podium has two wheels so it can be tilted and moved easily. Nice Podium Randy. Picture was taken with your Phone? Nice job. I love red oak. YEP! I had to fight them off just to steal that one picture! GEEZ! Maybe they’ll come after me with a Warrant for doing that!? That is very nice!! GREAT job!!! 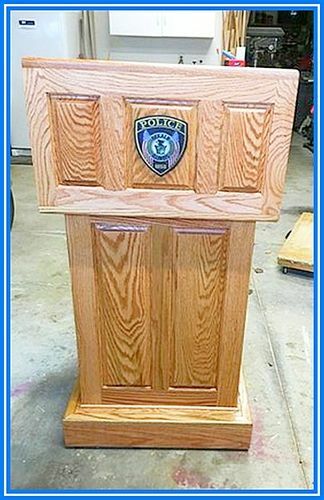 You did a wonderful job on this podium.